Wilderness expert Ray Mears teaches actor Ewan McGregor how to survive the Honduran rainforest. One man and twenty five girls, the Bachelor must find his ideal date. Ray Mears on jungle survival where Ray builds a raft from giant bamboo. Fashion from the island known for it's batiques and laid back style. Acapulco then the town of Oxaca for the Day of the Dead celebrations, BBQing all the way! 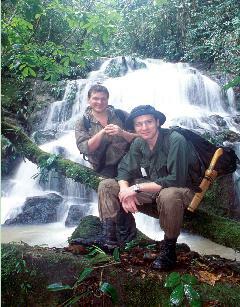 Ray Mears and Ewan McGregor in Honduras.